Getting started with Excel is easy. Sign up for our 5-day mini-course to receive easy-to-follow lessons on using basic spreadsheets. No thanks! Take me back to the article. The next function we'll learn helps you calculate the average of a large set of numbers: AVERAGE. This is another commonly-used function in many worksheets. Like SUM, its mechanics are incredibly simple. The above formula outputs $6,000,000, because the average of $6,000,000, $5,000,000, and $7,000,000 is $6,000,000. This formula also outputs $6,000,000, because it performs the AVERAGE of all the cells in the range C3:C5. 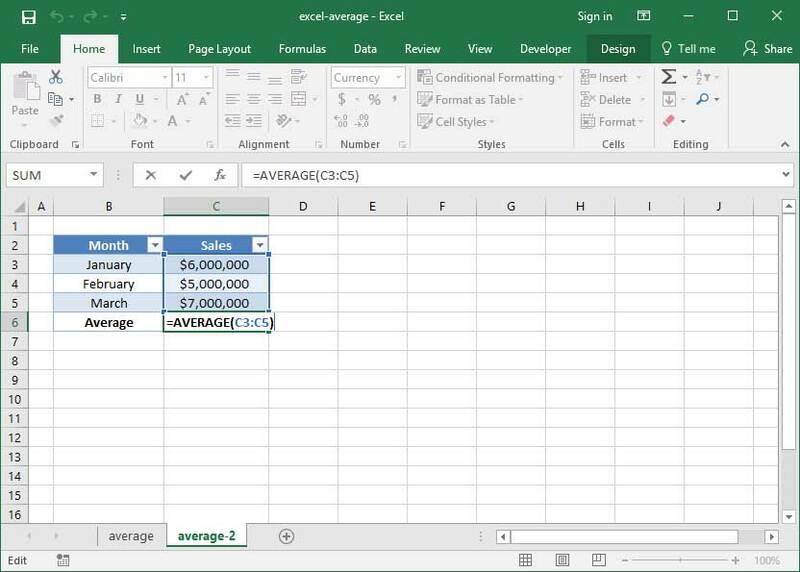 Excel also contains simple functionality to calculate the mean and mode of a data range. Just replace your AVERAGE formula with a MEDIAN or MODE formula to use it! If your AVERAGE function returns an error, it's likely because one of its inputs is an error like #VALUE! or #DIV/0!. If your function is returning one of these errors and you can't figure out why, try examining each of its inputs individually to ensure that they are all proper, real numbers.